The Mugler Follies, a cabaret extravaganza of typically Mugler-esque over the top proportion, debuts this week in Paris. Perfume lovers will be thrilled to know that the creator of ‘Angel’, ‘Alien’, ‘A*Men’, and ‘Womanity’ (Clarins Fragrance Group) has turned his creative talents in yet a new direction. Better known as Thierry Mugler, the man who now prefers to be called Manfred, is also a dancer, fashion and costume designer, photographer, and director, and clearly not one for limiting his creative expression to less than a half dozen outlets. For his Mugler Follies, Manfred has picked up the codes of traditional French cabaret and deftly turned them on their head to create magic at the convergence of theatre, dance, music, high wire acrobatics, and erotica. From the moment I entered the charming Comédia Theatre for a pre-opening show, all boundaries between real and unreal, audience and players, fell away as costumed actors (creatures, really) hobnobbed in the lobby with a bemused pre-show crowd which included a dynamic mix of cinema and stage stars including, Jean Reno and Marie-France, as well as Mugler master perfumers, Jacques Huclier (‘A*Men’ 1996) and Dominique Ropion (‘Alien’ 2005). A statuesque transvestite Picasso “Nu” struck poses and dodged squabbles between a shapely bouncer-ette and a ‘protester’ accusing Mugler of sexual perversion. Scandale! And that was just to set the stage. Once the curtains parted, I gleefully fell over the edge into a “Muglerized” landscape/space-scape/people-scape, punctuated with mischievous winks at familiar interplanetary and American icons including the Ziegfeld Follies, Marilyn Monroe/ Marlene Dietrich, and a more primal Chicago Queen Letifa with her murderous female inmates. Willing fragrance fans seem to have spontaneously, if unconsciously, contributed to the olfactive experience, as pleasant whiffs of ‘Angel’, ‘Womanity’, ‘Alien’, and ‘A*Men’ occasionally traversed the intimate, 750 places, Art Deco salle. 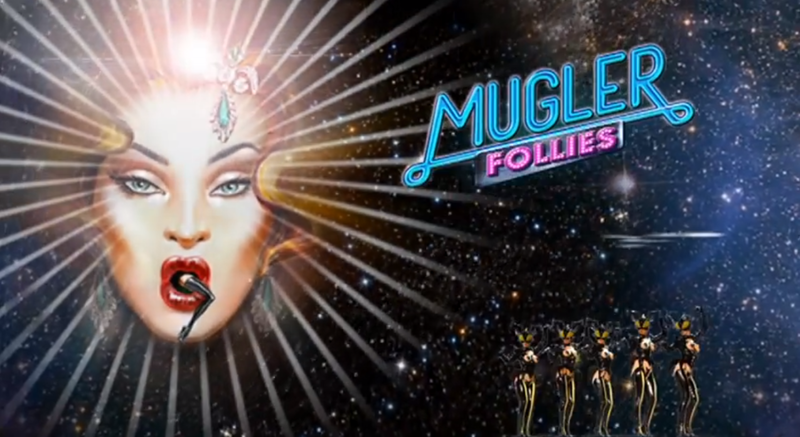 Mugler says he created his freeform Follies as a “…tribute to feminine beauty…”, and for “…children of all ages…”. I would simply add ‘and all nationalities’, as Manfred’s unique talents create a dynamic visual and sensory world which should appeal to adventurous Parisians and tourists ready to leave the familiar confines of the Champs-Elysées’s Lido or Pigalle’s Moulin Rouge, and venture forth to Strasbourg-Saint-Denis in the trendy 10th Arrondissment. Offering a choice of dinner menus (created by the legendary Fouquet’s restaurant) or non-dinner mezzanine seating. Could be a fabulous way to start off the holidays or ring in the New Year 2014. We’ll go next time you’re in town. So Parisienne! Happy Holidays. All the best.